US President says Russia's military actions against Ukraine were the “sole reason” he cancelled meeting with Russian President at G20. 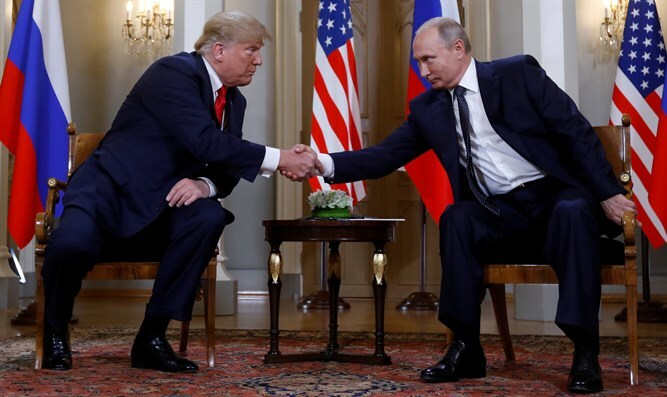 US President Donald Trump on Friday said that Russia's recent military actions against Ukraine were the “sole reason” he decided to scrap a planned meeting with Russian President Vladimir Putin at the G20 summit in Argentina, The Hill reports. Speaking with reporters, Trump downplayed the notion that the meeting was canceled due to developments in special counsel Robert Mueller's investigation into Moscow's interference in the 2016 US presidential election. "We don't like what happened, we're not happy about what happened,” Trump said during a meeting with Japanese Prime Minister Shinzo Abe, referring to Russia's seizure of Ukrainian naval vessels and personnel earlier this week. “On the basis of what took place with the ships and sailors, that was the sole reason," he added. White House press secretary Sarah Huckabee Sanders said the decision was made aboard Air Force One en route to the summit after Trump discussed the Ukraine situation with his national security team. Russian and Ukrainian naval forces faced off in the Black Sea Sunday, with the Russian navy blocking a key waterway during the confrontation. The incident threatens to reignite the tensions between Ukraine and Russia, which intensified in 2014 when Russia occupied and annexed the Crimean Peninsula from Ukraine.